Nice clickable interface with lots to drill into. Unfortunately, all the information is in a clickable map that you have to drill into. A rare grouping of pioneer-era cottages and houses located on a block that appears to have been settled according to an informal “frontier” (pre-suburban) development pattern: a mixture of early rural properties and small dwellings in non-standardized lot layouts. The area, which was located just outside of the City boundary of 1851, between the Union Race Course and the fenced-off Potrero Nuevo tract, may have originated as a “squatter” village. 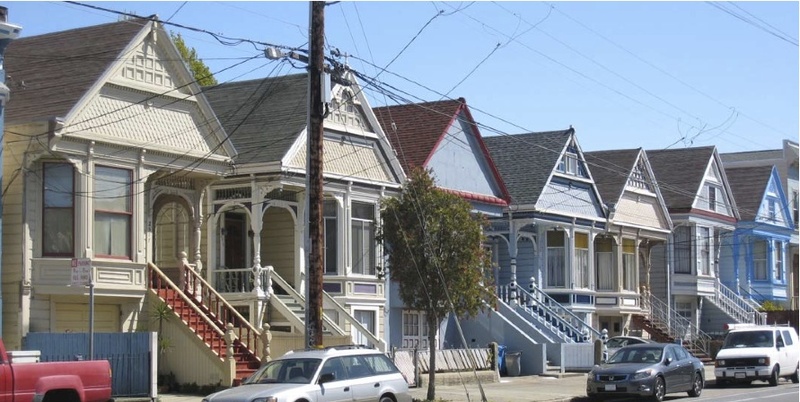 Central Mission area that resembles an “ideal” Victorian-era suburban neighborhood: a corridor of mostly high-style architecture and detached, single-family dwellings for the 19th-century middle classes. 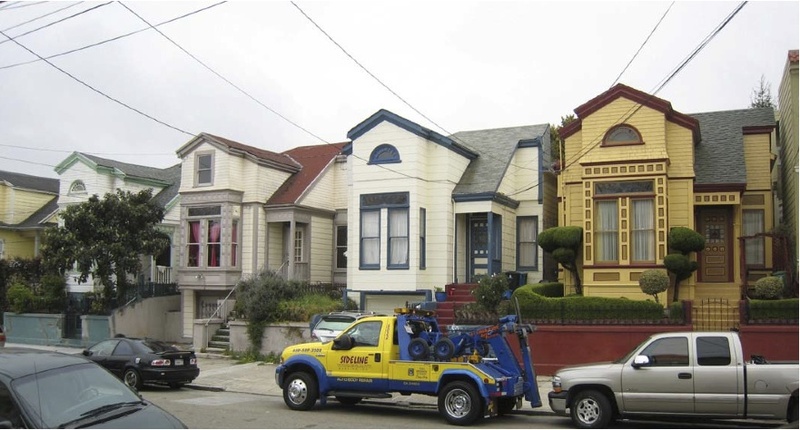 Located between very early streetcar lines on Howard (South Van Ness Avenue) and Folsom Streets, the area developed as one of the Mission’s early, prototypical residential neighborhoods. Note that “The Folsom Ladies” are included in this Shotwell district. Corridor of Victorian-era, high-style architecture and homes for 19th-century upper middle classes, located along the eastern edge of Horner’s Addition, one of the City’s first platted residential suburbs. The area is eligible as an extension of the designated Liberty-Hill Historic District. Areas west of Guerrero Street (outside of the survey area) also appear to be potentially eligible extensions. 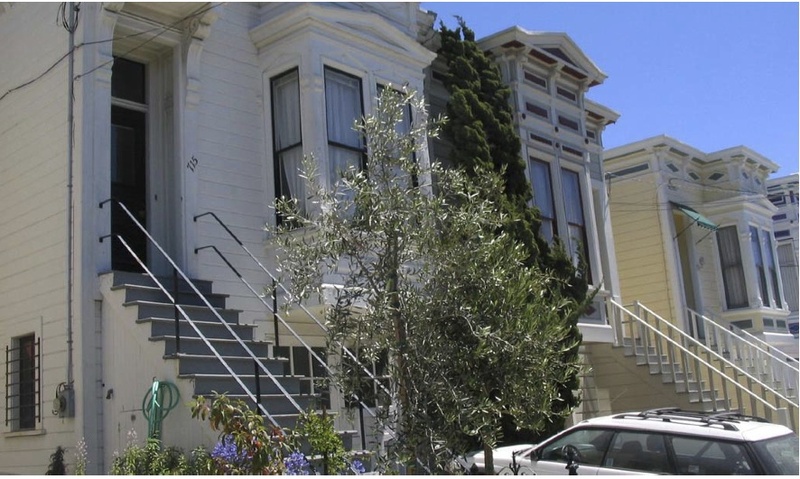 An intact representation of 19th-century middle-class housing and one of the earliest residential suburbs to be developed in San Francisco, Horner’s Addition. 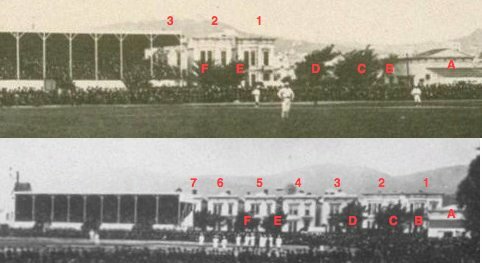 Major building starting in the 1860s and continued through the turn of the century. The area’s houses range from “workingman’s cottages” in the flatlands to grand mansions on the hills. The area is also associated with surviving the 1906 firestorm, which was halted immediately to the north on 20th Street. 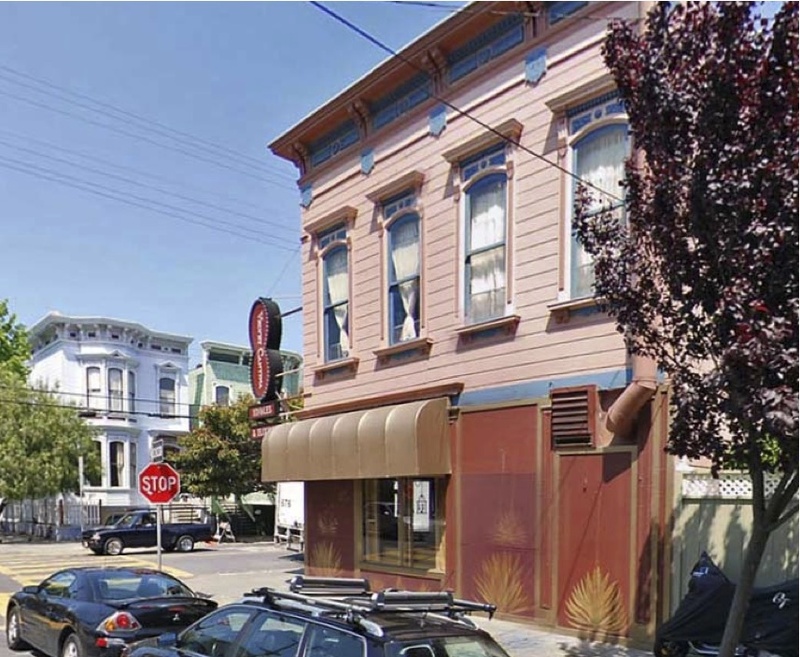 An architecturally consistent corridor of Italianate and Stick-style buildings – flats above shops, row-houses, and cottages – on 23rd Street (and extending to Bartlett and Valencia Streets), representative of the late-19th-century character of the dense, urbanizing Mission-Bartlett-Valencia corridor. A row of “false-front” Italianate-style cottages and two-family houses designed to follow the early, affordable townhouse model, which persisted to the end of the 19th century: flat façade, centralized entrance flanked by windows, tall parapet and bracketed cornice – and no bay window, which was a later and more expensive elaboration. 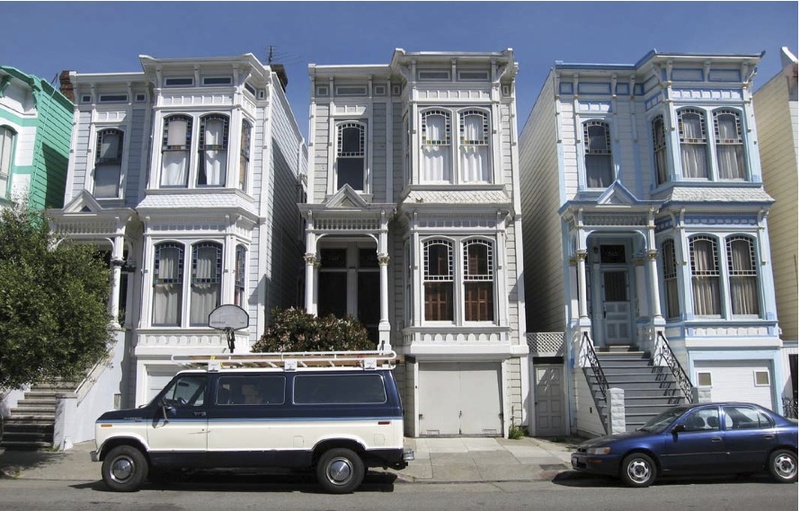 The row also reflects the historic “working-class suburb” character of the far eastern Mission District. 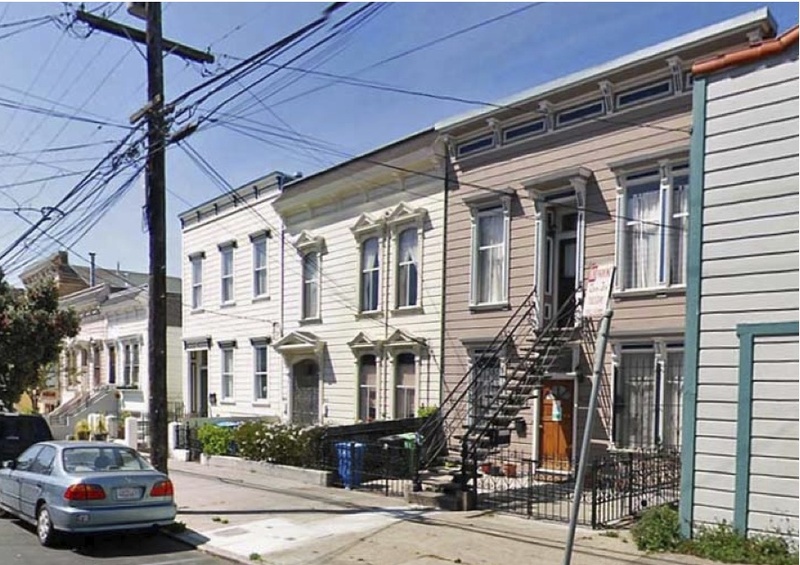 Several blocks that exhibit late-19th-century/early-20th-century “enclave” patterns of development south of 24th Street: larger, more elaborate houses and flats located on major north-south streets; smaller, plainer “working-class” flats and apartments located on mid-block alleys; and merchant quarters and apartments above shops on 24th Street. The far southern Mission District in-filled during the post-fire reconstruction period of the early 20th century. A unique grouping of identical, detached row-houses built by merchant builder C.C. O’Donnell and landowner George W. Fowler that exhibit a combination of Stick, Queen Anne, and Shingle-style influences. 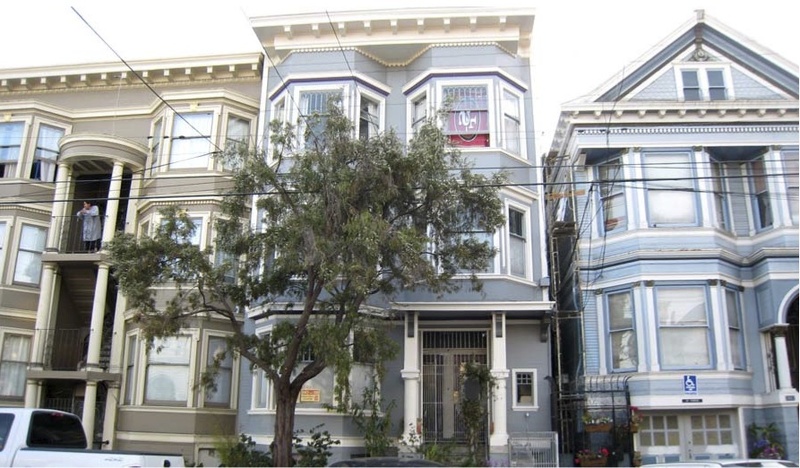 The row also reflects the development of distinctive, yet affordable, working-class/middle-class dwellings in the far southeastern Mission District. 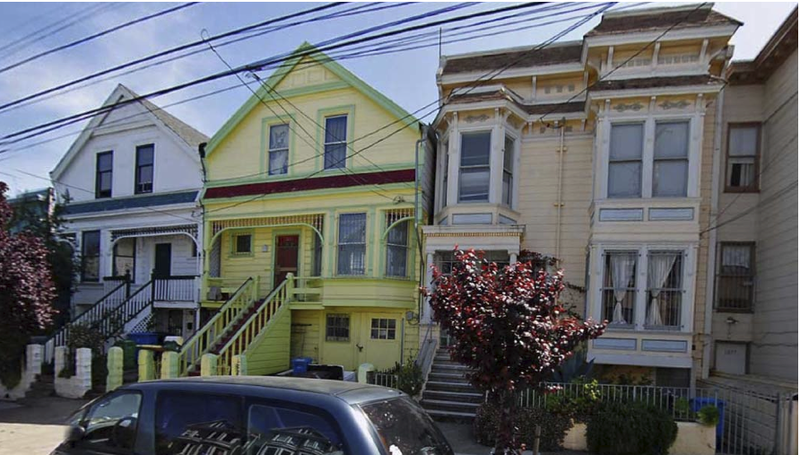 A block (and three additional properties) uniformly developed with the signature Stick-style row-house cottages of Gottlieb Knopf, a prolific merchant builder in the eastern Mission District. The block contains the largest collection of Knopf buildings known to exist, and includes several that were “modernized” during the 20th-century interwar period in keeping with the general form, massing, and layout of Knopf’s row-house designs. A block almost uniformly developed by prominent architect Thomas John Welsh with Stick/Eastlake and Queen Anne-style row-houses, for real estate developer Baroness Mary E. Von Schroeder. The block contains the largest collection of Welsh buildings known to exist; most of his early work was destroyed in the Earthquake and Fires of 1906. A planned arrangement of residential flats (including a mixed-use commercial building on a gore lot) developed around a cul-de-sac, representing late-19th-century urban residential tract design. 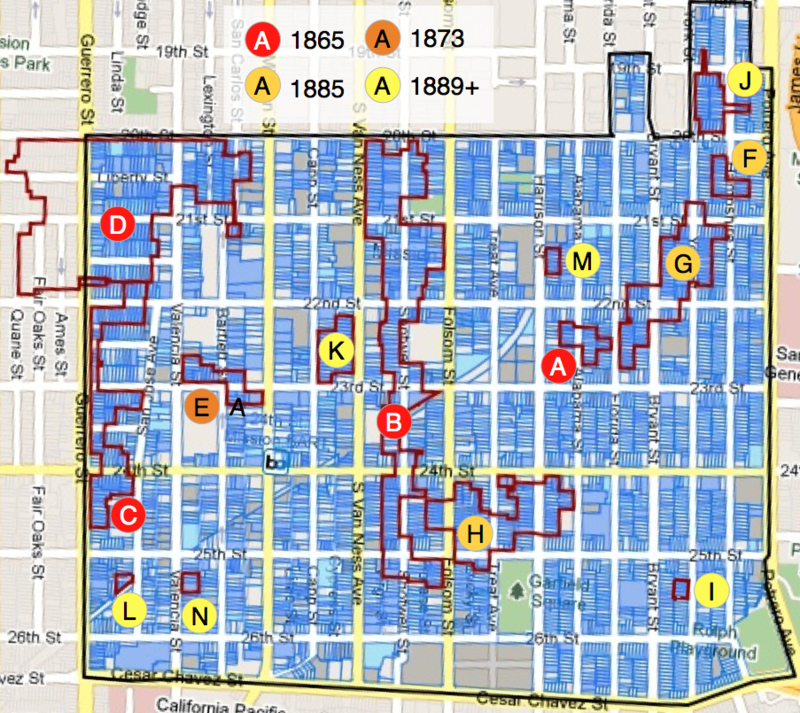 The grouping also reflects a pattern of increasing densification that occurred in the far southwestern Mission District near the turn-of-the-century. 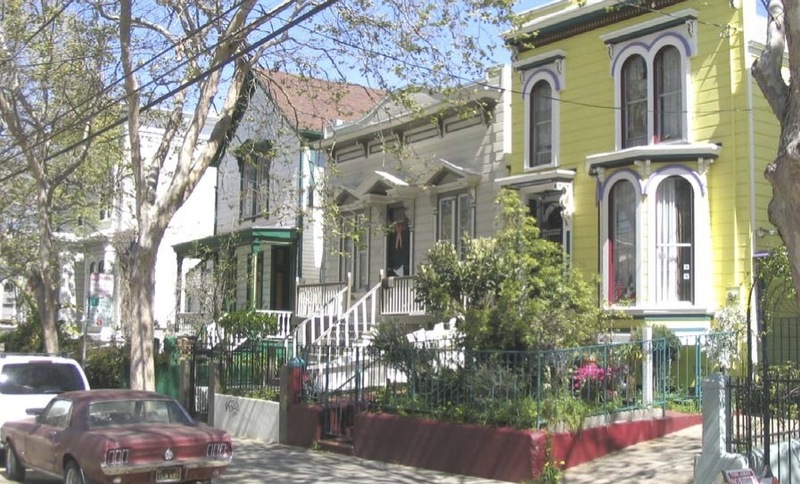 A row of Queen Anne-style cottages developed by A. Olsen, a prolific merchant builder in the eastern Mission District. The row represents the largest, most intact collection of Olsen buildings known to exist. 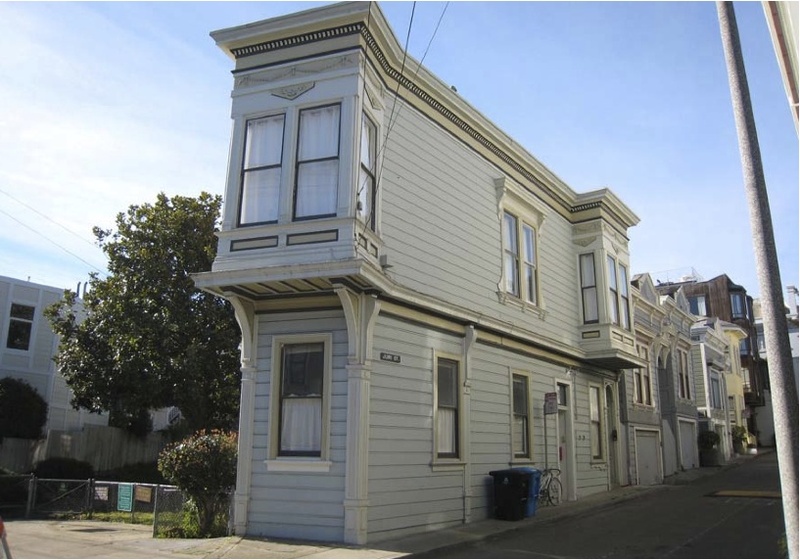 The row also reflects the historic “working-class suburb” character of the eastern Mission District, particularly Harrison Street, which contained a railroad. A rare cluster of late-19th-century/early-20th-century accessory structures designed according to pre-automobile patterns of development: horse-oriented, with upper story lofts and winch-and-pulley systems, located on a service alley. The grouping reflects the utilitarian character of a back-alley along a major transportation corridor in the Mission District around the turn of the century. UPDATE: sigh, really need to dig a bit first. I used to live in a corner of a house in Horner’s Addition-East. That house is so beautiful; my landlady obviously loved it a lot and took such good care of it. Man I miss living there, gorgeous houses and big trees everywhere. These maps are great.